Since 1987, Aquatelescopic has been designing and making fully customisable telescopic and fixed enclosures. As specialists in toughened safety glass, we only use the highest quality materials and innovative manufacturing processes. Your enclosure is unique and by choosing Vénus, you are guaranteed expert knowledge. 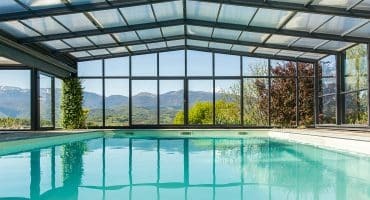 An Aquatelescopic enclosure lets you get more out of your pool, using it longer and more often, regardless of the weather. By creating a greenhouse effect, the temperature of the water increases by 6 to 12°C (depending on the regional climate and the type of enclosure). With a high-level enclosure, your pool can be used all year round. It also creates a luxury living space for relaxation and leisure. An Aquatelescopic enclosure keeps your pool clean and protected from contamination and other debris. 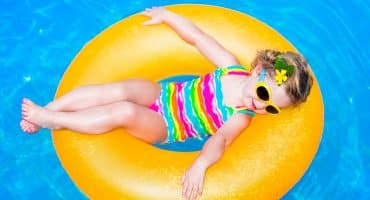 As a result, you spend much less time and money cleaning your pool. Your pool will also be sheltered from acid rain that affects the pH balance of the water. And finally, an enclosure prevents the pool water from freezing over, making it easier to manage during the winter months. Our enclosures are compliant with AFNOR NF P90-309 standards and are CE certified. We have intensified our research, particularly on levels of resistance. Our products therefore provide levels of wind, snow and fire resistance that are far higher than those required by the mandatory French standard. We can also guarantee certain snow and wind building standards. One of the distinguishing features of Aquatelescopic enclosures is the tempered safety glass used on the side panels. This material is fully transparent, creating brilliant levels of brightness. Therefore, the pool is fully visible from the outside and there is a crystal-clear view of the surroundings from the inside. Apart from being a luxurious feature, this glass provides unmatched levels of durability and guarantees complete transparency that doesn’t fade over time. Be it the shape, dimensions, range, materials, etc., each Aquatelescopic enclosure is unique. Our design office team, made up of made up of architects and engineers creates the perfect enclosure for its surroundings, no matter how complex the design is. Once a solution to the technical challenges has been found, Aquatelescopic lets customers fully customise their enclosures with colours, door openings, windows, roof finishing, etc. Our manufacturing processes are regularly audited within the framework of our CE certification and guarantee that only fully reliable structures leave our workshop. The traceability of materials used and the inspection at each stage of assembly considerably lower the risk of poor quality. Regardless of where it’s going, each enclosure is thoroughly inspected and carefully controlled and packaged before being shipped. Therefore, enclosures for private pools receive the same treatment, care and attention as those destined for public pools. Which type of enclosure ?